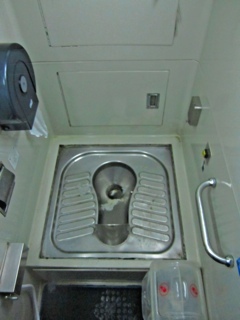 In many ways, the train service in Thailand puts British Rail to shame. (even the toilets!) On an 11 hour train ride we arrived exactly on time. The staff were friendly, the food on board was good and cheap and they serve you in your seat or, in our case, in your private first class compartment. 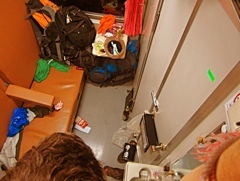 Our compartment was about 8 feet by 5 feet and had a long sofa-like chair that somebody that comes in and folds up into 2 bunk beds complete with sheets, mattress and pillows. 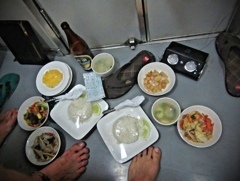 It was one of the most comfortable train rides I have ever been on. We were woken up by a knock at the door 20 minutes before we arrived at our destination at precisely 4.27 in the morning then all we had to do was wait a couple of hours at a pleasant cafe with good Internet for the bus to take us to the ferry to Koh Samui. Looks fantastic! 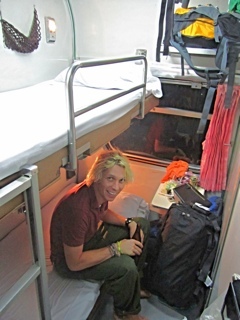 I’ve always wanted to go on a sleeper train. Glad you made it, just!